Fashionable and exciting, this filigree heart scroll garnet ring from Apples of Gold Jewelry features a warm 14K yellow gold combined with a deep red garnet gemstone! The AA rated, genuine garnet gemstone is cut into a heart shape and measures 4mm by 4mm in size. Around the garnet gemstone is a shining gold heart, and the band of the ring features a filigree pattern complete with cut out heart shapes on the band, which offers a bit of a peek-a-boo design! 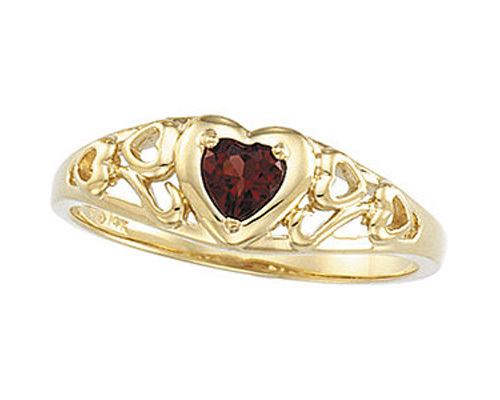 We guarantee our Filigree Heart Scroll Garnet Ring to be high quality, authentic jewelry, as described above.